Banglalink and Titas Gas T&D Company Limited have signed a five-year partnership contract recently. Under this contract Banglalink will provide Titas Gas T&D Company Limited with best in class mobile solution like-- Voice Call, 3G services and SMS services for 5 years. The signing ceremony was held at Tigers Den, head office of Banglalink in Dhaka. 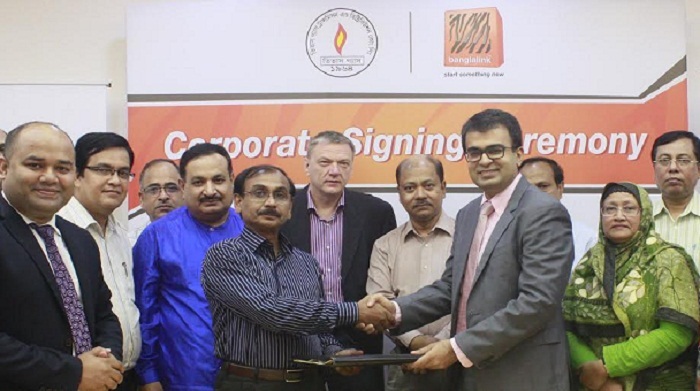 The agreement was signed by Nasar Yousuf, Head of B2B Business, Banglalink and and Mushtaque Ahmed, Secretary/General Manager, Titas Gas T&D Limited. Erik Aas, Managing Director & CEO of Banglalink and Engineer Mir Moshiur Rahman, Managing Director, Titas Gas T&D Company Limited were also present in the ceremony.